Individual self adhesive packing labels "Do Not Bend," qty 100. Individual self adhesive packing labels "Do Not Bend," qty 500. 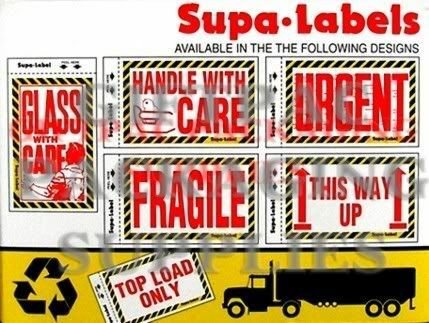 Individual self adhesive packing labels "Fragile," qty 100. Individual self adhesive packing labels "Fragile," qty 500. Individual self adhesive packing labels "Glass with Care," qty 100. Individual self adhesive packing labels "Glass with Care," qty 500. Individual self adhesive packing labels "Handle with Care," qty 100. Individual self adhesive packing labels "Handle with Care," qty 500. Individual self adhesive packing labels "Heavy," qty 100. Individual self adhesive packing labels "Heavy," qty 500. Individual self adhesive packing labels "Priority," qty 100. Individual self adhesive packing labels "Priority," qty 500. Individual self adhesive packing labels "This Way Up," qty 100. Individual self adhesive packing labels "This Way Up," qty 500. Individual self adhesive packing labels "To/From," qty 100. Individual self adhesive packing labels "To/From," qty 400. Individual self adhesive packing labels "Top Load Only," qty 100. Individual self adhesive packing labels "Top Load Only," qty 500.